More insights in the full article here. So, logically, the problem must be intelligence deficiency or, to be charitable (after all, we are iOS users), inferior education, lack of wisdom, tech ignorance, or any combination of the three. They also smell funny and have eyes like Michael Dell. In the end, it’s about what one can afford to buy. Income inequality is rampant right now, so some people can’t afford the high end Apple products. People need to stop condemning those who can’t afford the more expensive smart phones and understand it about surviving. I have more respect for a people who put the importance on the necessities of life ( food, rent, clothing, & utilities)before an expensive smart phone. Who the hell cares what smartphone someone owns. Be happy at least you have a device that allows you to commumacate with others and can give the opportunity live a better life. Apple or Android at least you have a phone!!! MacFreek, literary license is antigrammatical, not grammatical. An ad hominem attack is always poor rhetoric, truth has nothing to do with it – a weak argument is a weak argument. I won’t even mention your egregious spelling, the only display of “literary license” I see in your scrivenings, and only one of many reasons your literary license should be suspended, if not taken away. You add nothing to the conversations here, which certainly doesn’t make you unique, but your profligacy is what I find most disturbing. Too bad you can’t channel some of your verbal vomit in a more productive way. What motivates you to spend so much time irritating people? You remind me of a child who doesn’t care what kind of attention he gets, so long as he gets attention. A child exhibiting that type of behaviour is a child who needs help, and I assume you’re not a child. Do you need help? Is there something missing in your life? Do you get some kind of kick out of reading and re-reading your diarrheic diatribes here? Please, do us all a favour, get a job, a hobby, a pastime, anything that takes you away from here. How do you find the time, or indeed, the inclination, to post here so often, when you have nothing to add to the conversation? Here is a summary of how many posts you made today, just a sampling, for your own consideration. One solid, thoughtful post would be quite enough, but this? Give us a break, please, and perhaps you’ll be doing yourself a favour as well. There’s a whole world out there that isn’t obsessed with “fanbois” (or whichever variant spelling you prefer). And remember this, it is better to remain silent and be thought a fool, than to open your mouth and remove all doubt. Yeah, this is all buncha caca. I means, I’m broke, my truck up an died, I had a women but she met another an pffft she was gone. If it weren’t for bad bad luck I’d have no luck at all. An yet still I got me an iphone. Yessir, it’s a 2g, but still works real good. My god, feller, there’s a country western song in that post just a dyin’ to break into the Grand Ol’ Opry! Set it to guitar and banjo and it’ll be number one in no time at all! Articles like these make me cringe and disgusted even though I dont have any android product and own a iphone, ipad and a MBP. This is one of the most despicable articles written in favour of Apple products. I am educated, have engineering certifications, work as a fire protection systems inspector, and I prefer Android (Nexus GED devices) which are top tier. I am also tech suavy, I build my own high end PC’s, provide tech support for security systems, as well as mechanically inclined. Having used both ios and android, IMO apple devices and ios are crap, and marketed to masses (aka customer base) that are for the most part naive, and generally easily confused, and easily influenced… I.e., sheep. 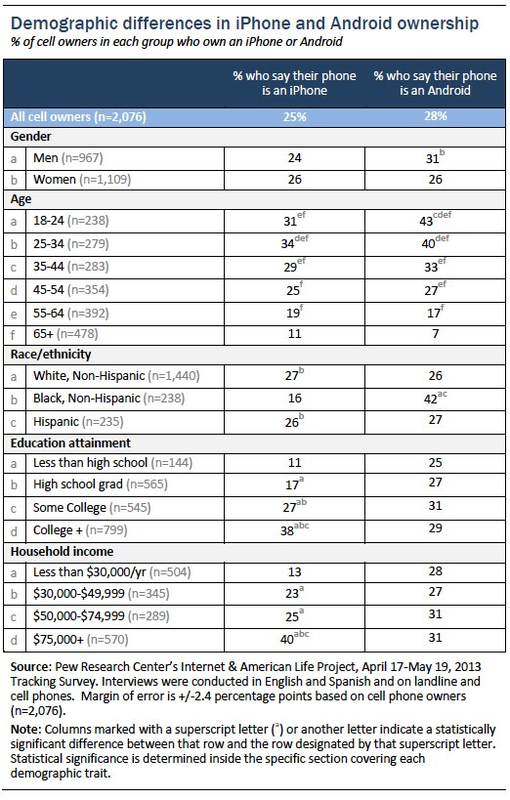 Most apple ios users are asinine, and think a phone/tab is a status symbol that elevates their social status in society. Most android users on the other hand, know a phone/tab is just a device. Nothing more, nothing less. It serves a functional purpose, and is not a symbol. These kinds of threads are so very boring. I’ve used both Android and Apple. I’ve met some ugly people with iPhones and Androids. People use what they want to use. If you’re low key and don’t want to do much with your phone, iPhone is for you. If you do a lot of tasks, get an Android. This statistic is just stereotypical for entertainment. Is this satire? I sure hope since this would be the most pretentious thing I’ve ever seen. It ranks right up there with “Let them eat cake.” Wow.